I went to the gym today. I had a 3 mile run and back/biceps/core on the agenda. I wasn't sure how the run would go since I did a long run on Sunday and according to my plan today should be a day off. But I want tomorrow off instead. So the 3 miles on the treadmill went fine. I ran mostly at 5.0 mph, didn't feel like pushing myself beyond that. And strength training was good. I was in a hurry to get home in time for dinner so I was working hard and moving quick. Things felt a little harder as a result, or maybe I'm just in need of a rest day. In the end my workout was done, which is the most important thing. I still got home 15 minutes after dinner started, "Mommy, you didn't eat beans and cream with us!". My husband is Honduran and we eat black beans with Honduran cream (like sour cream but more salty and less sour), avocados, corn tortillas and salsa for dinner several nights a week. I sat down to eat and my son stayed at the table with me until I was done. Ah, the family dinner hour. Might be my favorite part of the day. Two-and-a-half year olds are sponges and our son will usually ask me several times during dinner, "So, mommy, how was your day?." 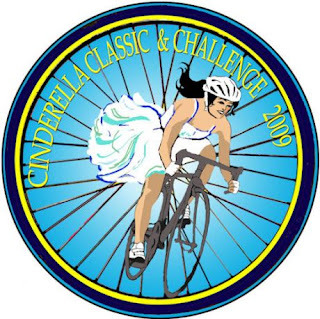 "The Cinderella Classic is a 65-mile recreational bicycle ride for women/girls only. The Cinderella Classic is not a race - take your time and enjoy the trip. Males do not ride Cinderella. They do the organization, support, rest stops and SAGs for the Cinderella. This unique 100-kilometer tour winds through Amador, Livermore, Diablo, and San Ramon Valleys. It is mostly flat with a few moderate hills. From the start at the Alameda County Fairgrounds in Pleasanton, the Cinderella Classic circles through town, out through the vineyards of Livermore, then north and along the base of beautiful Mt. Diablo to Danville, where it turns south and winds back to the Fairgrounds. Charming Princes will be at three rest/food stops along the way, with a cold lunch at the second. Our SAG service patrols the entire route to provide rider assistance if required. A Cinderella Classic ride patch is awarded to every rider. We offer some of the area’s best SAG support. They patrol the route to cool you when you’re hot, pump you when you’re flat, mend you if you break...these folks are good! Rest stops will have fruit, drinks, and snacks." I was sort of hesitating to sign up for this given that I have a 10k the very next weekend and I've never ridden farther than 50 miles. But when I read the description and saw the $40 registration fee I couldn't resist. I haven't told Miguel yet. I think I'll be calling mom in for some support. And I haven't forgotten about the Tour of Napa Valley 30 miler in August that still sounds lovely. Throw in a couple of camping trips and Oh, it's going to be a fun summer! You are amazing. Seriously, you are my motivation and inspiration. I SO did not want to do anything yesterday, but I had the time, and it had been a week since I ran. And I had read your blog. So at 7pm after putting the baby down I grudgingly put on my shorts and running shoes and walked in the dark to our little condo workout room. I ran 5 miles but it was not easy! But man, I felt so great afterwards!! I don't know how to quite find the time to do this consistently. Maybe once I'm sleeping more I'll be more motivated to workout at 7pm? It's pretty tough, and also my only time alone with my husband. Hmmm... I guess I'll just keep taking it one day at a time. p.s. And I want some black beans with Honduran cream.